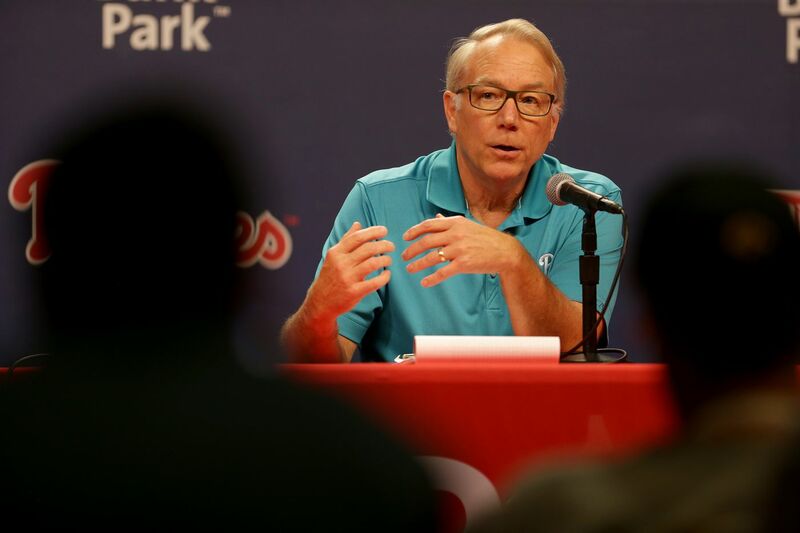 Andy MacPhail, Phillies President, talks about the season during a news conference at Citizens Bank Park on Tuesday. Andy MacPhail's grasp of reality was refreshing. Ask the Phillies' president about his team and he did not see a bunch of young guys presenting beautifully on a daily basis. He saw their weaknesses and their wild inconsistencies. He saw what the rest of us saw and he was not afraid to say it. "The defense wasn't what it needs to be," MacPhail said during his 35-minute media session Tuesday at Citizens Bank Park. "We need to do a better job in our division. But we are the most inconsistent team I've ever been associated with." That's saying something because MacPhail has been around the game in a variety of roles for over five decades and he has seen his share of bad baseball teams. For the record, he thought this Phillies team was an improved one, but he was not sure from month to month if a lot of the players were going to be Dr. Jekyll or Mr. Hyde. "[Zach] Eflin was a perfect 5-0 in June with an ERA of 1.76 and in September he's got an ERA over six," MacPhail said. "[Vince] Velasquez had an ERA under one in July and it's 10 in September. … Which [Odubel] Herrera are we going to get — the one that entered June with a slash line of .313/.404/.485 or the guy who hit .205 in August? And, God bless him, one of my favorite people on the team, Hector Neris, I mean which Hector Neris is coming into camp [next season] – the one since he came back from Lehigh Valley that struck out more than half the batters he faced or the guy who gave up eight home runs in 11 innings?" MacPhail said the list of inconsistent players he had put to paper was much longer than that, but you get the idea and it is surely a conundrum for the Phillies as they go about the business of how to construct a better team in 2019. With the exception of Aaron Nola, not a single impact player was consistently good from start to finish in 2018, which was one of the main reasons it was so difficult to stomach manager Gabe Kapler's syrupy sermons about the team on the days when it was obvious that the Phillies had played poorly. And since that was almost every day for the last eight weeks of the season, it became even more sickening. Apparently it even got under MacPhail's skin just a little bit. "I think he's fine," the team president said. "He will probably get an all-expense paid dinner where he's going to listen to me drone on for two hours. I watched this happen to Dusty Baker. If you're just overly positive then you lose your credibility with the fans after a while. You have to find a way to craft your message that is not critical of your players or negative, but acknowledge that there are some areas … we need to make some improvements." As much as MacPhail, a native New Yorker, seems to have a better grasp of what makes Philadelphia fans tick, he still does not get it entirely. He lauded the improved attendance in 2018 and said it was a direct result of the Phillies' improved level of baseball that was reflective in the record through the first week of August. Phillies president Andy MacPhail met with the media Tuesday afternoon at Citizens Bank Park. "A quarter of a million more people went through our turnstiles this year than they did last year," he said. "USA Today had an article on baseball attendance diminishing. We were the second highest percentage gainer in all of baseball behind the Astros, who were world champions." The Phillies still finished 17th overall in attendance, which is way too low for the largest single-market team in baseball. The improvement in attendance was hardly staggering. "Our TV ratings finished up 26 percent," MacPhail said. "So when I talked about meaningful, significant, measurable progress, it's not just the fact that we won 14 more games than we did the year before. It's our TV ratings and that a quarter of a million people that came through our turnstiles more than last year. It wasn't on presale. It wasn't on the bet of what was going to come. It was based on what they saw on the field in 2018." Perhaps, but MacPhail should know by now that Phillies fans are going to need to see much, much more to keep the team's modicum of momentum going in 2019. And the Phillies have a chance for a significant free-agent haul this offseason if they can sign either Manny Machado or Bryce Harper. And, really, it should not stop there. They'd be wise to add a veteran pitcher, too, and there's going to be a good crop available, including Arizona's Patrick Corbin and former Phillie J.A. Happ. Add a superstar player and an established veteran pitcher and the phones will immediately start ringing in the ticket office. "Your job is to win and that's what the fans want and that's what will assure them of being happy," MacPhail said. "So what the baseball ops department has to do is try to find the best chance of winning, whether that includes a superstar player or whatever, that's the goal to reach for." If the Phillies have not signed a superstar player and upgraded their pitching staff by the end of this offseason, it is hard to imagine them being significantly better or the fan base being significantly happier at the start of next season. Do those two things and they might even be willing to listen to Kapler gush about how the revamped roster is profiling beautifully.